With the mercury up in the stratosphere this week, I figured it was a good day to dust off my slow cooker again and give it another try! When I want to slow-cook something, I almost always gravitate toward my Dutch oven. We do have a couple of crock pots - one smaller and one large. I usually use them to keep something warm for a party. For cooking? Not so much! I was thinking about making margarita chicken. Lime, agave nectar, TEQUILA . . . what's not to like about that, right? I almost decided to grill the chicken, but then I remembered the slow cooker. 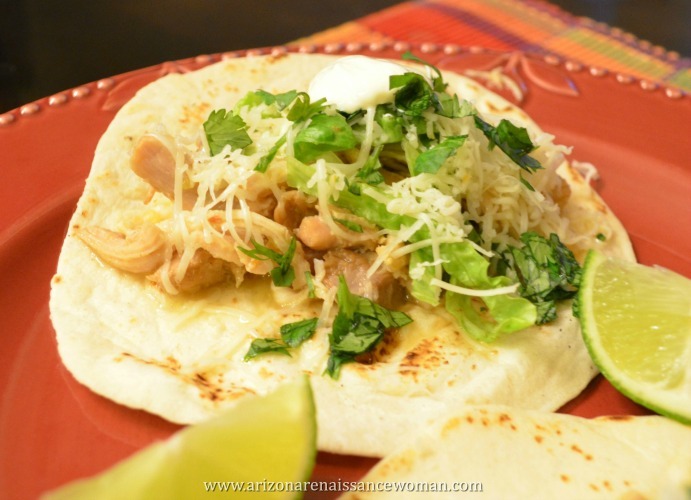 I created a barbecue chicken taco recipe a few months ago, and that turned out good, so . . . why not? In general, I used the ingredients that I use to make margaritas. I decided to use orange juice rather than Cointreau or Grand Marnier. I figured there was no need to use such expensive ingredients if they're just getting mixed in with a bunch of other things! We'll see how this turns out. I'm sitting here smelling the chicken simmer away as I type this. I'm not totally sure that the poultry seasoning, liquid smoke, and margarita ingredients will jell the way I want them to, but I have high hopes. I'm going to keep the rest of this recipe simple, as there is already a lot going on! A little bit of lettuce, cheese, and an extra squeeze of lime should do the trick! One other important thing to note about this post - this is the first time I've tried taking pictures with a DSLR camera and not my phone! I've been trying to learn a little bit more about photography lately (a little more than the NOTHING that I knew before), and I had some fun trying different settings and angles this time. If the look of my photos is a little inconsistent this time, that's why! I'm still shooting under my kitchen lights . . . but . . . one thing at a time, right? I've got a ways to go until I finish this project, but I'm only 2 recipes away from 75! That's huge. Al that point, I'll only have 25 more to go . . . and about 7 weeks to do it. Wow. Going back to school in mid-August might end up feeling like a vacation at this rate. Ha ha! 1. Start the chicken mixture: Heat the olive oil over medium heat in a medium skillet. Add the onions, lower the heat a bit, and cook until they are soft and somewhat browned, about 8 to 10 minutes. Add the garlic and cook for an additional minute. Turn the heat to high and cook for about 3 hours, stirring occasionally, until the chicken is very tender. If your slow cooker is larger than mine, you might want to reduce the cooking time. Mine took about an hour or so just to start simmering! 3. Remove the chicken pieces from the slow cooker. Using a knife and fork, pull/shred the chicken into small, bite-size pieces. Using a hand blender, blend the sauce that remains in the slow cooker until smooth. Place the chicken back in the slow cooker (in the sauce) and keep warm. 4. Prepare the tortillas to your liking: I prefer to heat mine in a dry cast iron skillet over medium high heat for about 30 seconds to a minute on each side. After each one is done, I place it on a sheet of aluminum foil and immediately start the next one. I stack them on top of one another as I work. When I'm done with the whole batch, I wrap them completely in the foil. You can keep them warm in a 250 degree oven if you wish, but I didn't bother as this was my last step! 5. Assemble the tacos: For each taco, place a tortilla on a plate. Spoon some of the chicken mixture down the center of the tortillas. Top with a small amount of the lettuce. Sprinkle on some of the grated cheese. Finish with some chopped cilantro, a squeeze of lime and maybe even a drizzle of sour cream. :) Enjoy! If I'm going to use the better camera, I should be a little less sloppy about chopping/sprinkling my cilantro! Oh, well. These worked out pretty nicely! As I said before, I wasn't sure about the tequila, poultry seasoning, citrus, and tomatillos all melding together, but they really did! Once I added the garnishes, it was even better! My husband loved them! We were full after two, but we almost ate more because they were so good. After dinner, I promptly transferred the rest of the filling to a freezer container and stashed it away for another day. I need to make different tacos tomorrow! Ha ha. We'll be looking forward to those down the road, though. The sauce is rather . . . saucy. Thin. Whatever you want to call it. I'm OK with that. You could add something to thicken it up if you want, though I'm generally not a fan of adding thickeners. I'd rather put the sauce in a pan and place it on the stove (before the shredded chicken is added) and reduce it for a little while. It's up to you (of course). I thought it was fine. I just used a slotted spoon. They're just a little bit drippy, but it didn't bother us! I think I'm gradually bonding with the slow-cooker. I usually like to keep checking on and poking at my food. This time, I reminded myself that it wasn't necessary. A slow-cooker is so slow (at least to me) that nothing's going to burn. It was kind of nice to walk away and not worry about it for a while. Well, I did go back and stir it a couple of times. I had to. Ha ha.